there are some things you just can’t rush. pops’ buttermilk biscuits, sanding before the paint is dry, & constructing our junk headquarters. as junk conservationists, (that’s right, we’re not hoarders…we’re junk conservationists…it’s highly scientific. google it.) we consider it a duty of epic importance…it’s our duty to build a preserve for wild junk. an amiable habitat in which all junk can coexist with one another … a habitat in which all junk can live harmoniously and symbiotically in peace. the entrance to this wild habitat is finally complete. a sacred entrance to our sanctuary of junk. complete with texas harbor salvage tin for the ceiling, chippy peely beadboard salvaged from old farmhouses across the county, and a spanish 6′ in diameter chandelier we scored from richard hargrove at zapp hall. the doors were custom made….we spent hours designing the perfect entry doors…dad scoured the country and had these made from our sketch out of old reclaimed cypress. 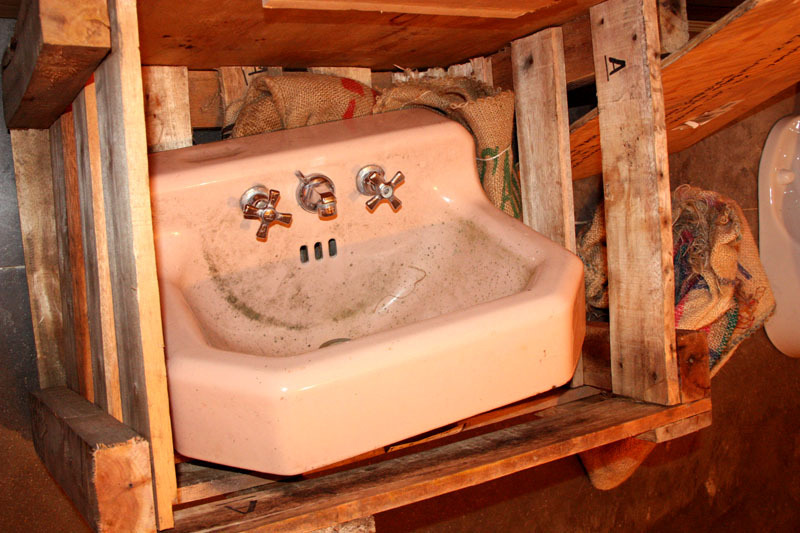 and just last week, this pink sink arrived on the pony express straight from jersey. salvaged victorian ceiling tin from kwaku (featured in dierks bentley’s episode), chippy peely beadboard that our friend matt hager salvaged from a farmhouse in carmine, texas, a beyond awesome glass-with-giant-crystals chandelier we scored years ago from hector the collector, and even awesome-er (yep, it’s a word, google it) doors… (a moment of silence for these amazing doors with an even amazing-er story)… THE. DOORS. chippy peely PINK & white doors salvaged from an old man named HOOTIE (that’s right, y’all…you can’t make this stuff up) in asheville, nc. hootie had a long white beard and a creek running right through the middle of his shop. hootie’s in heaven now and we thank our southern stars that our good friend, nita, bought these from him about 15 years ago…and then we bought them from her at zapp hall. unfortunately, we never knew him, but may the legend of hootie and his white beard be forever immortalized at our junk gypsy headquarters. our sanctuary of junk. and lest i forget, the CRAZY huge giant corbels from our friend matt white at recycling the past (who also hooked us up with the PINK sink). 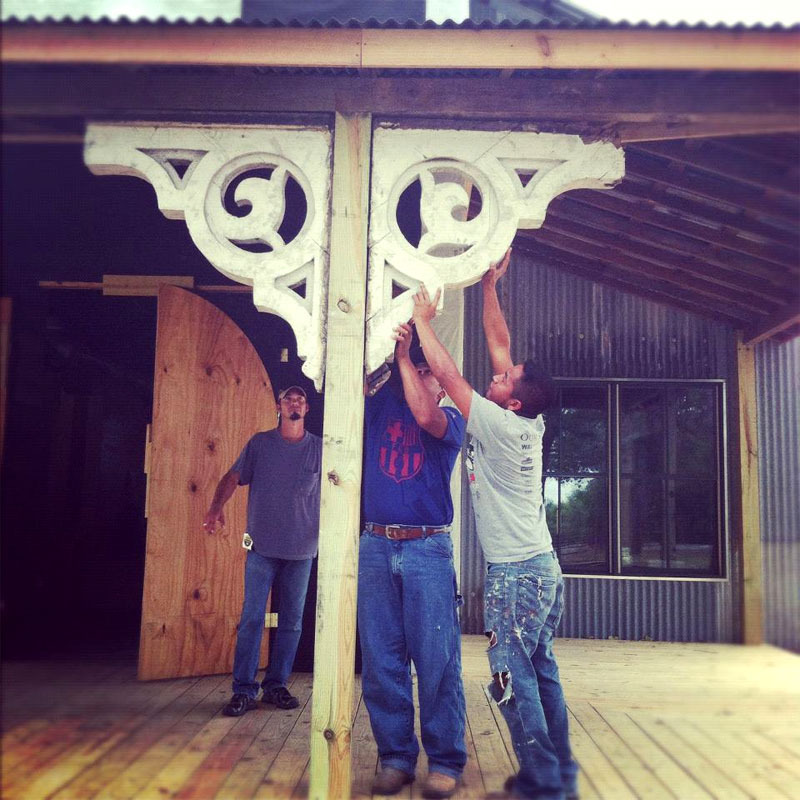 because bigger is better when it comes to architectural salvage. greeting all who enter our sanctuary of junk. 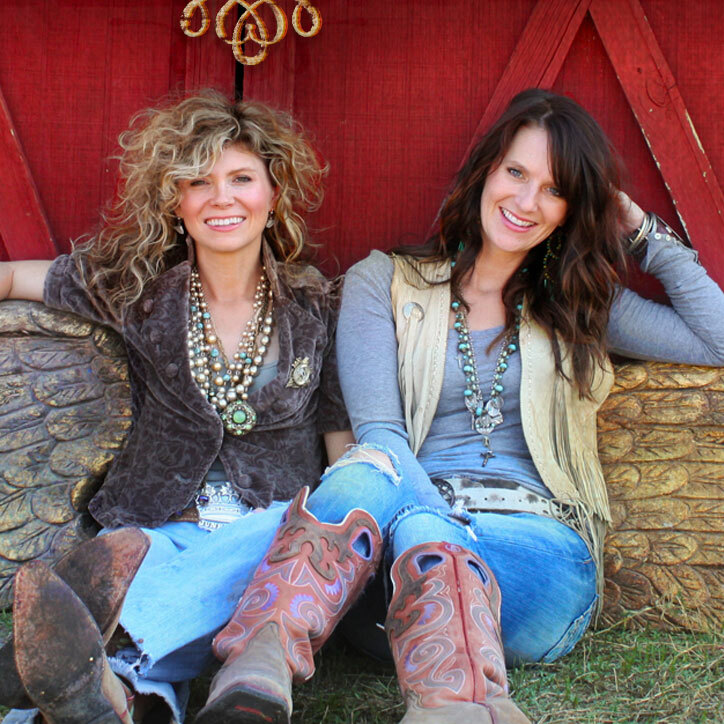 stay tuned y’all…there’s waaaaay more junk making it’s way to our gypsyville world headquarters! we hope to open sometime this summmmmmer!!! Wow!!!!!!! That looks AHH-mazing. 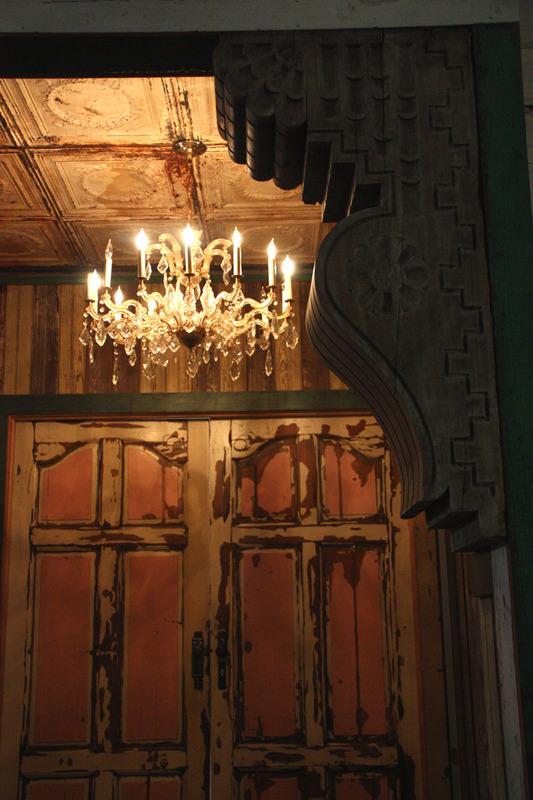 Love the wood, the architectural details & of course the flea market lighting. That tin roof will sound good during those Texas rainshowers. It’s breathtaking and I am in awe. Wow. I know this was a long time coming for ya’ll! It was worth the wait!!!! That building (you’re dream) is perfection!!! Absolutely yummy!! Lovin the pink sink and am ready for a road trip to Texas to see the finished sanctuary! Amen! Absolutley amazing…I will have to make trip to Texas to see this when you have finished!!! I just really, really, REALLY NEED y’all to get this joint finished. Can’t wait to see it!! Absolutely amazing! I must make a trip over from Shreveport when you finish. What you are doing reminds me so much of the Tiny Texas Houses I’ve seen that this guy from Lulling does, he uses nothing but salvage, amazing stuff. Can’t wait for you to finish so I can hit the road! Ladies, this looks Incredible!!!! I can not wait to come visit this junk mecca. I’m so excited for what ya’ll are doing. Ohhhhhh….I just can’t wait to visit!! I”m getting all giddy just thinking about it!!! This is frickin’ awesome! Excuse the wording, but that’s what came straight from my brain to my mouth while looking at pictures… I love Junk Gypsy style! Sure miss Texas, Blubonnets… and did I say Junk Gypsy! Awesomeness! LOVE LOVE LOVE! It’s amazing…can’t wait to see what you do with the PINK SINK…we just took one EXACTLY LIKE it out of our 1950s rental property!!! SHOW ME PLEASE:):) Can’t wait to visit soon!!!!!!!!!!! I love it!!!!! I can’t wait for ya’ll to open!!!! Awesome. Can’t wait until your show on Saturday. LOVE IT! 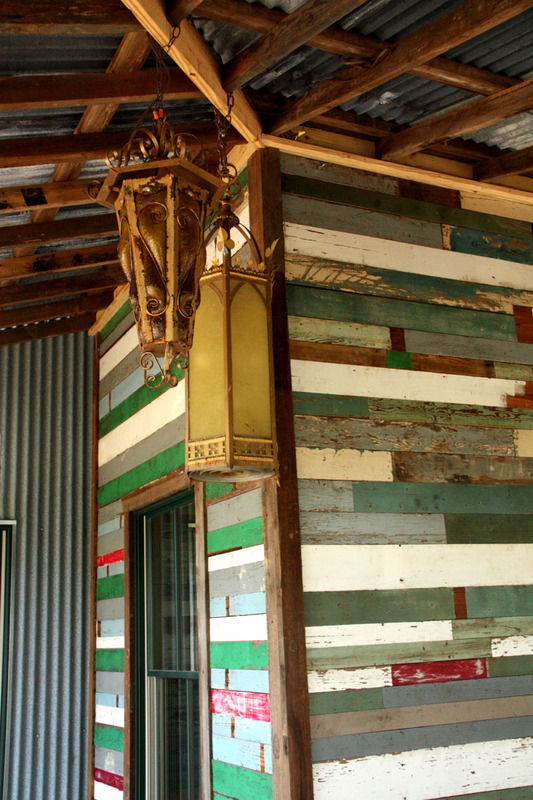 Love the reclaimed boards, tiles, fixtures, everything! Will have to make the trek to behold it when it’s complete. You two are awesomeness! Love your stuff. I live in Dallas and need to come your way when this is finished. I have never been to Round Rock! I thank Ms. Miranda Lambert for hooking us up. Love that girl. Oh my! That entrance looks like angels sing “Hallelujah” each time the doors open! I cannot wait for you to open them for business! Y”all done good! This is so BEAUTIFUL, can’t wait to visit, so inspirational, in the process of moving into a new home and I am going to use everything you do for my for my new “gypsy style of decorating” Also, absolutely love the HGTV series. Be still my beatin’ heart! I’ve been a fan for a long time, I’m lovin’ the show on HGTV and I find myself antsy to be makin’ a trip to Round Top. Keep livin” the American Dream! I wish you the junkiest success!!!! I can see the love and thought put into each and every big and little thing ya’ll have chosen for “gypsy heaven.” Just one question – did the funky painted doors from the church find a home here? I can’t stop thinkin’ about those doors… PS don’t work yourselves into a tizzy, take a sweet tea break. We can wait on perfection. Oh My Gosh!!!! IT IS AMAZINGLY BEAUTIFUL!!!!!!!!!!!!!!!!!!!!!!! I Love it and LOve what y’all are doing!!!!!! I LOVE IT!!! CAN’T WAIT UNTIL THE OPENING.! Totally. AMAZING! Are y’all going to be open year round in round top now? CANNOT wait for you to finish and get open so I can come and spend some money…. and maybe finally meet you junk mavens! I’ve been a “junker” since I was a kid…… before everything became an “antique”! 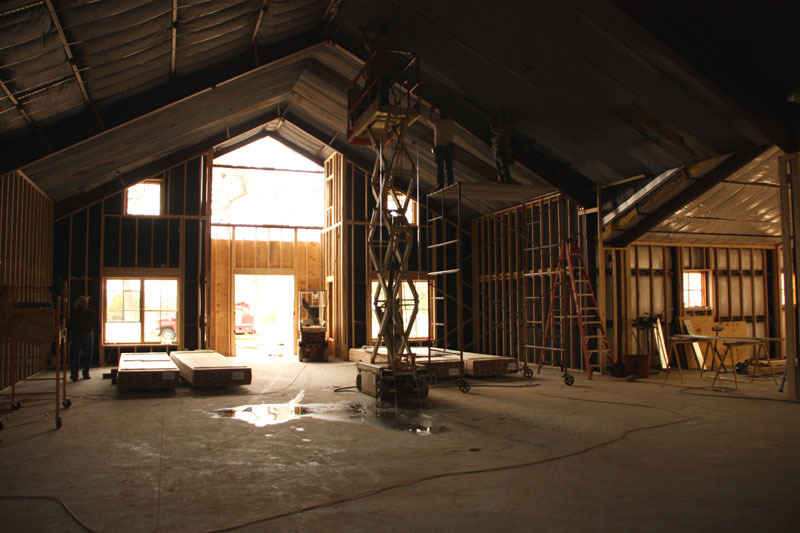 The place is looking FANTASTIC… can’t wait to see it completed. I have been trying to decide where my next road trip should be to and after seeing your new digs I now know!!!! Wow that place is amazing!!!!! I can’t wait to come for a visit. Looks GREAT girls!!! Cant wait to see it finished!!!! Can’t wait to be back in the GREAt state of TExAs, y’all ! I’m going to have to come down for a visit! It looks so beautiful! absolutely positively love love love the place!!! 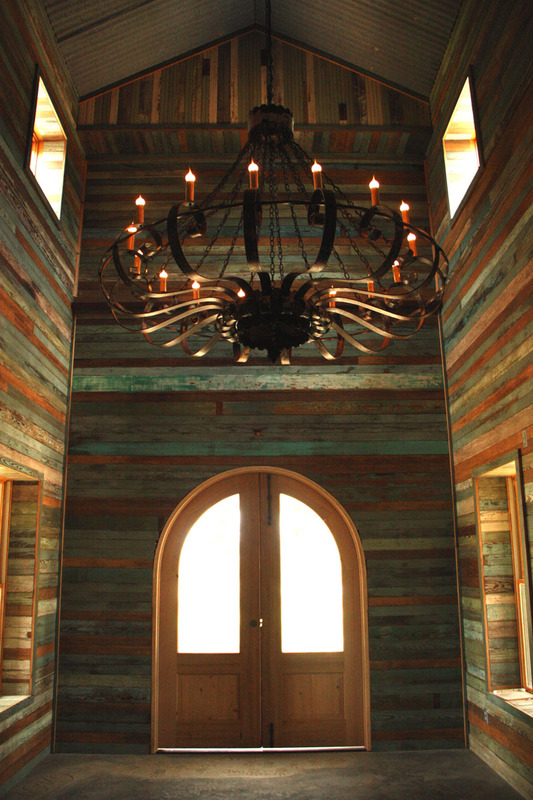 love the reclaimed wood on the walls, the lighting…everything! and love your show on hgtv! Drove by it on my way to Round Top last weekend…it is so amazing from the outside so i know the interior is going to blow us all away! So excited for the grand opening…already getting a group of gals together !! This building is just SO YOU! IT Speaks Junk Gypsy to the soul and you have been so lucky to find Hoot and his doors of glory. Zapp Hall loves you girls to help by giving up this fabulous lighting fixture! What a fabulous Chandelier! That PINK sink is so much GOOD JUNK! Way to go! I so do hope I get to visit you again and see you in your new home one of these days! Need any help with Round Top Market Days? I so adore what you have been doing and so love seeing your dreams come true! So excited for y’all!!! It looks amazing. Can’t wait to see it in person! HUGS!! I look forward to taking a tour soon. Congrats! Okay… I officially want to live at the JG Headquarters. Or at least decorate my house like this. Absolutely beautiful, y’all! Can’t wait to see it in person! Wow! BEE -u-TEE-fUL!!! Made me a little teary – just how I picture my one day retirement dream home in the country. Congrats girls! Dream on, my sweet gypsy girls. We are all living it with you! All I can say girls is HURRY THE HECK UP!!!! i CAN’T WAIT MUCH LONGER TO SHOP THERE. It all looks absolutely amazing! And ~ I loved last weeks JG show! Well, I love them all! AWESOME, AWESOME is all I can think to say. Congrats to you all! I just now clapped my hands together in excitement while reading this. I’m so excited! (My daughter just rolled her eyes) I’ve already told my husband we’re making a trip down the road. Those wood plank walls are awesome and I can’t wait to see them in person. I cannot wait to see this live & in person, but in the meantime, I’m lovin’ watchin’ the progress! TFS & HONEY HUSH! Love! Love! Love! We are building a barn/residence in MT and you are inspiring me! Just saw you guys on Hoda and KLG and added you IMMEDIATELY to my Google reader. I’m a big city girl (first NY and now LA) but love love love how you decorate. It’s interesting and different and fresh and COOL. Could you please fix the link to your website? When I try to connect,I can’t. Seems like something needs to be fixed from your end. I’ll keep checking back to see when it lets ppeople connect again. Thank you. Just found your show recently on HGTV. I love your style. You ladies inspire me ! Hi, y’all. Caught your show & loved it. Trying to connect to your website, with no luck. My husband suggests you ask your webmaster to buy more bandwidth/per month? Is he/she onto that? It should just entail him or her calling the ISP…and paying more dinero, unfortuantely. Sure hope this can be fixed. (On the other hand you could transfer your website to another Internet Service Provider, which would take a few days, to transfer your domain name and all that. But better than it not working?) Forgive my unsolicited and uninformed advice here. I am a new fan & eager to see your site!! Yee Hawww! Love the blog and love your show!! Keep it coming girls! When is your website gypsyville going to be fixed?? I’m dying to get on there! I live in Houston, and I cannot wait until y’all are open! I love junk gypsies! I wanna be just like y’all when I grow up! I’m only 45!!!!!!!! Amazing!!! Junk Gypsy amazes and inspires me!!! OH MY GOODNESS!!!!! I LOVE EVERYTHING ABOUT IT!!!! If I ask the sisters styingquestionwould they respond abd guve me suggestions or say if I’m on the righttrack? Girls you are the best! Cannot wait to visit the sanctuary! Hello! Are yall open yet?? Can we say ROAD TRIP from Upstate NY to Texas next summer??? You girls are living my DrEaM!!!!! So excited for you! HQ is looking like Heaven on Earth! Can’t wait for you to open! Loved your HGTV show and look forward to the Endless Yardsale footage!! Junk On Soul Sistas! I can’t wait til y’all are up n runnin!! I have absolutely fallin in love with your show and have gotten SOO much inspiration. Roadtrippin from CO to see y’all once it’s done. Thank you for providing the inspiration I’ve been needing 🙂 God bless junkin!! It looks fantastic! Who wouldn’t love a pink sink? It’s long way from Chicago, but I hope I can make a trip to gypsy mecca someday. beautiful!! I’ve always wanted to go to RoundTop Texas and now I may actually plan a trip for sure!! Wondering if you will be open around Halloween? I have a friend visiting from the east coast that week and wanted to bring her to Round Top and specifically your place. Let me know. THANKS! We may not be young in age but definitely in heart and we love to junk. I was in Knoxville before your show came on and ate dinner with on of the guys involved in your show(a friend of my son). He said I would love the show and he was so right. Thank you all for everything you do! You are the most inspirational artists/designers to come along in a looong time. Keep sending us more of your ideas. Hope there’s another season of your show in the works! Can you tell us more about antiques week ? Any news yet on the opening? I’m dying to visit! I had the pleasure of visiting yesterday while in Roundtop/Warrènton. Beautiful! Simply beautiful! It.is.SPECTACULAR! I hope to make it back to Round Top soon..(went before I opened my shop in Bellport, NY in 2001…GOOD LUCK! !